You can now stop People from Adding you in their WhatsApp Groups without Blocking them! HomeSocial NetworkYou can now stop People from Adding you in their WhatsApp Groups without Blocking them! If you are annoyed by people (not even in your contact list) adding you in random WhatsApp groups, this one’s for you. The cross-platform messaging and VoIP service is rolling out a new feature that will allow you to control who can add you in groups. 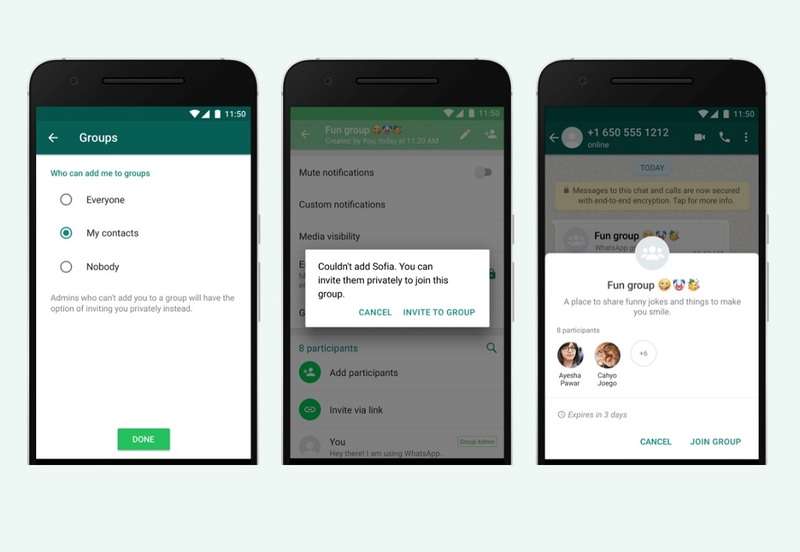 Whatsapp announced that with the help of new feature unknown users won't be able to add you in their groups. In addition to that, you can stop everyone from adding you or you can just let things go as they are and allow everyone to add you. Until now, the only way to stop being added was to block the group’s admin. The feature should not come as a surprise as the service has been trying for quite some time now to prevent misinformation from spreading. According to BBC, political campaigners (before last year’s elections in Brazil) used some kind of software to add several people into their politically driven groups without their knowledge and permission. Time Magazine adds that this approach is quite common in India as well. To be on the safe side, WhatsApp has already started labeling messages that are forwarded to make them stand out. In addition to that, the maximum number of times a message can be forwarded has been set to five. Moreover, a new fact-checking feature was also introduced recently in India which will let the users verify the authenticity of messages that they receive. It should be noted that even if you have prohibited everyone from adding you in a group, you can still be sent a private link to join, which expires in 72 hours, giving you 3 days’ time to ponder about whether to join the group or not. "With these new features, users will have more control over the group messages they receive. ", announced WhatsApp team in a blog post. You can avail the new feature by heading to Account -> Settings -> Privacy -> Groups. After that you will be given three options about who can add you in groups (1. Nobody 2. Your Contacts or 3. Everyone). The feature was launched a couple of days ago but it will take a few weeks for it to be fully available for all users.